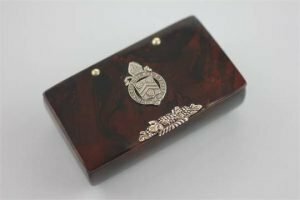 A lacquered papier mache snuff box, early 19th century, the simulated burr walnut box with applied Winchester College arms. 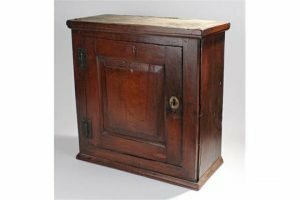 A late 18th Century hanging oak cabinet with a moulded cornice above a fielded panel door enclosing a shelved interior with moulded plinth base. 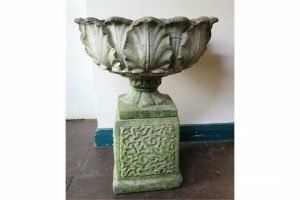 A garden urn in the form of acanthus leaves on a pedestal foot and square plinth base. 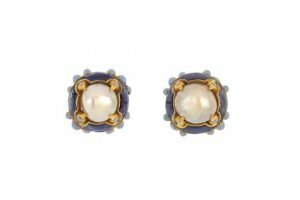 A pair of cultured pearl and enamel ear studs. 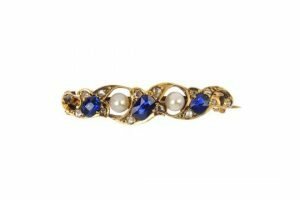 Each designed as late 19th century cultured pearl and blue enamel clusters, to the later post fittings. 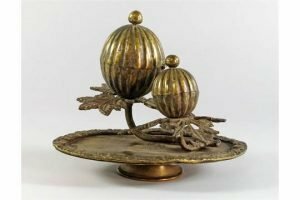 A Turkish brass inkwell, late 19th/20th century, the oval moulded base with foliate decorated border, emitting foliate branches with domed hinged wells. 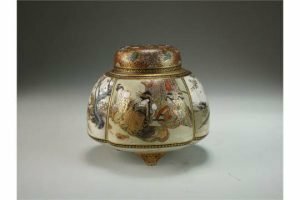 A Japanese Satsuma koro and cover by Ryokuzan, Meiji era, of lobed form, the domed cover pierced with holes, the body decorated with figures and birds in landscapes. 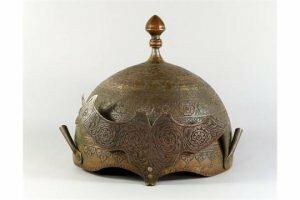 An Indian ceremonial metal helmet, 18th century, of domed form with faceted finial applied with prow and plumage holders, with the remains of side pieces to rim, overall incised with bands of flower heads and trailing foliage. 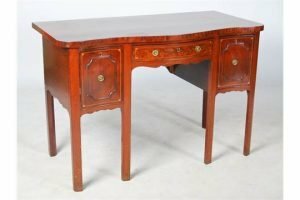 A 19th century mahogany and boxwood lined serpentine sideboard of neat proportions, the shaped top above a central frieze drawer flanked by two deep drawers with applied moulded details, raised on six chamfered supports. 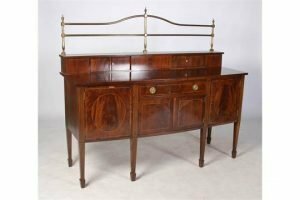 An early 20th century mahogany bow front sideboard in the George III style, the stage back with lacquered brass gallery above sliding stage doors, over a central frieze drawer and pair of cupboard doors flanked by cupboard doors, raised on six tapered square supports with spade feet. An 18ct gold diopside and diamond cluster ring. 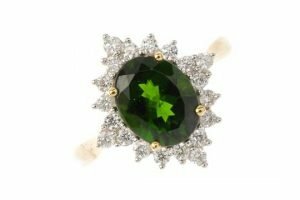 The oval-shape diopside, within a brilliant-cut diamond cluster. Estimated total diamond weight 0.50ct. Hallmarks for Sheffield. A late 19th century gold diamond and gem-set brooch. Of openwork design, the graduated cushion-shape sapphire and rose-cut diamond scrolling foliate motif, with seed pearl spacers. 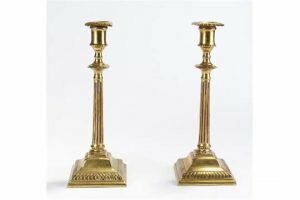 A pair of mid 18th Century style English brass candlesticks, circa 1760. The scones with arched gadrooned edges above a fluted tapering column and stepped base. 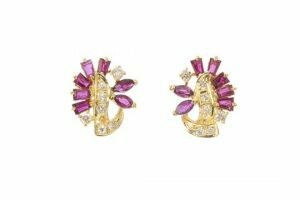 A pair of ruby and diamond earrings. Each designed as a brilliant-cut diamond scroll, with similarly-cut diamond, tapered baguette and marquise-shape ruby partial surround. Estimated total diamond weight 0.20ct. 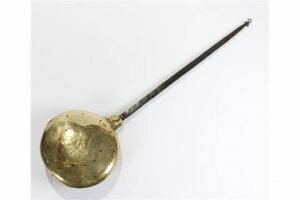 A 17th Century brass and iron warming pan. The hinged pierced pan lid with sun, flower and star burst engraved design, on a long iron handle. 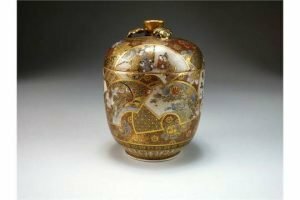 A Japanese Satsuma pot and cover by Kozan, Meiji era, of cylindrical form, the domed top with flower and leaf finial, decorated with overlapping panels of figures, birds and landscapes. 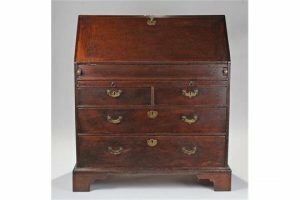 A late 18th Century oak bureau, the rectangular top above a brushing slide and a slopping fall enclosing pigeons holes and small drawers with a sliding well to the middle, having two short and two long drawers raised on bracket feet. 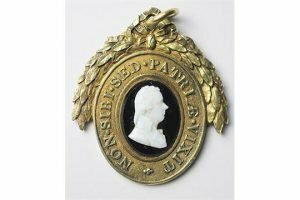 A 19th century silver gilt Pitt club medal, with white cameo bust of Pitt against a black background, for Augustus Warren Esq Junior, in original Morocco leather case with retailers label for Green Ward Green Ludgate Hill. 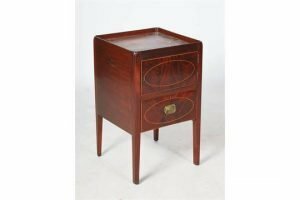 A 19th century mahogany and boxwood lined tray top commode, with raised gallery top above a cupboard door and single drawer, raised on rectangular section supports. 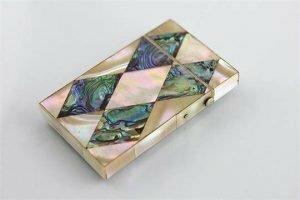 A mother of pearl and abalone shell calling card case, with diamond shaped designs throughout. 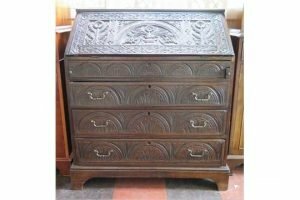 An oak bureau, with later floral and lunette carving, the sloping fall front enclosing a stepped interior with well over three long graduated drawers on bracket feet.